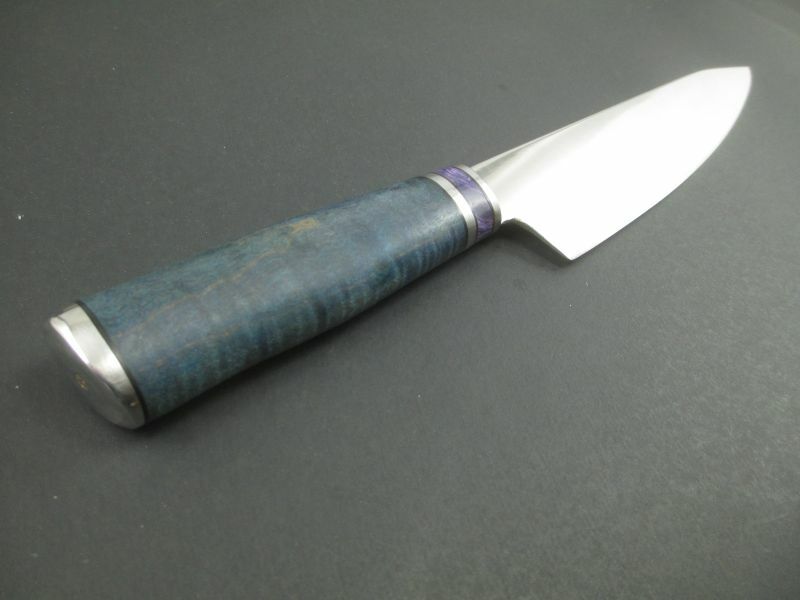 A through tang knife handle is durable and can showcase a beautiful piece of wood. 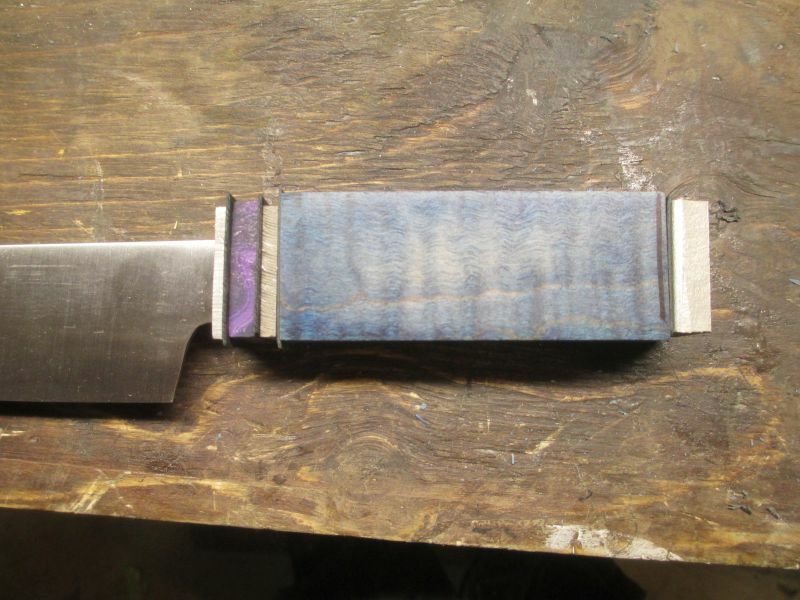 I like to make my handles about 4 to 4-1/2" in length. Before we get too far we need to look at the tang of the blade. 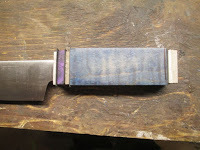 It's going to have a keyhole cut into it before the blade is heat treated. 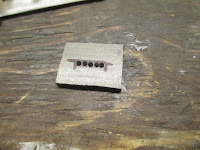 I used stainless steel and have found this to be quite difficult to make this hole and cuts after heat treatment. The end of the tang has 3/16" hole drilled in it. 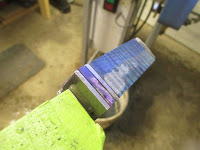 Then I cut a slit about 1/8" wide into the hole. A 10-32 x 2-1/2" stainless steel machine screw is shaped on the grinder to just about tolerance fit into the hole and slit. 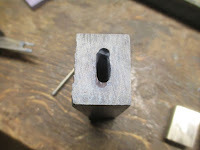 This should need some pressure, a vise for example, or tapping with a hammer in the anvil to fit in. 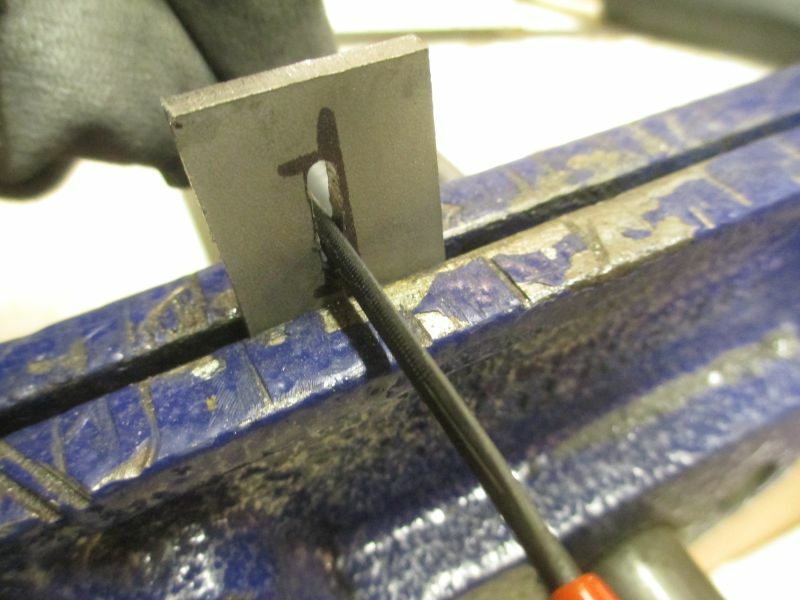 Don't worry if the screw seems too long, we're going to cut the excess off later. You may now heat treat the blade as per your usual method. 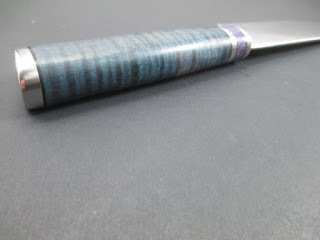 The front bolster is usually made from stainless steel or brass. 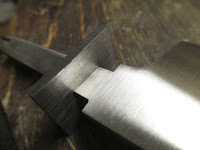 I like stainless as I usually have some pieces left over from cutting the blade profile from the stock. 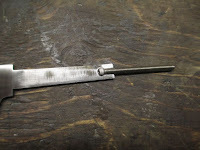 I lay the tang on the stainless and mark where the bolster needs to be slotted out. 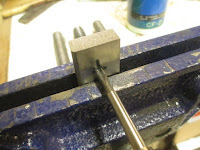 Here I center punch and drill about 5 holes in a line. 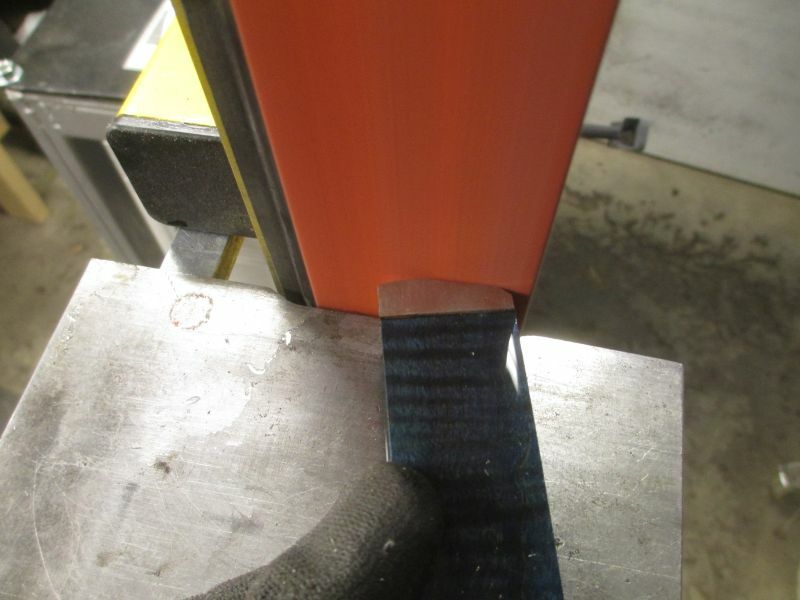 These holes have to be smaller than the thickness of the tang at the shoulder. 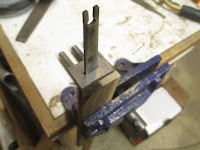 I like to use 5/64" or 3/32" drill bits depending on the thickness of the slot. You can file the slot a little bit larger, but you cannot make the slot smaller at any time. 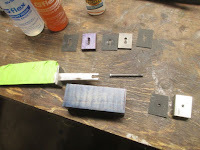 Here I am using needle files to connect the holes to make a slot. Test fitting the tang. It is always better to go slowly and fit the tang. File a little more and try fitting the tang again. Eventually the bolster will slide 99% of the way up the shoulder. 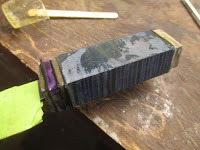 I put the taped blade in a vise with a piece of wood on each side. Clamp it tight. Slip a short section of pipe over the tang and gently tap with a hammer. This will drive the bolster on that last 1% of the way. This should create a gapless joint. 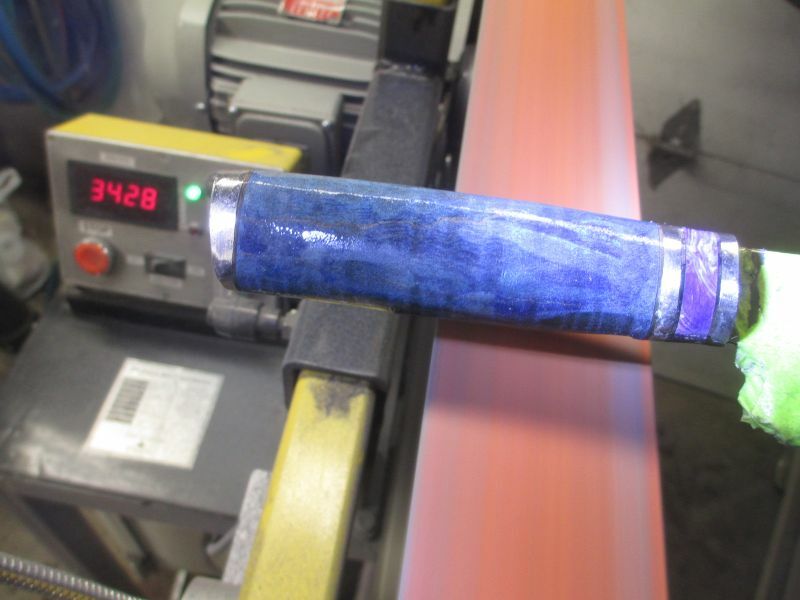 Here I only have to shape the bolster where the shoulders go. The stack refers to all of the pieces that make up the handle. A mix of steel, brass, spacers, gemstone composite, leather, wood, Micarta, horn or any other suitable materials can be used. The requirement here is they are larger than your finished handle is going to be. 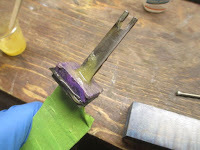 Here I am cutting a piece of Russian Lavender composite gemstone. The piece is about 1" x 1-1/4". Now with the tang laid on the block, I mark where the slot has to be. This slot can be much cruder than the front bolster as this slot will be unseen in the finished product. 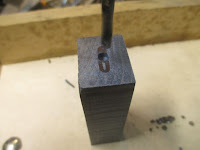 I use the drill press to drill three holes. 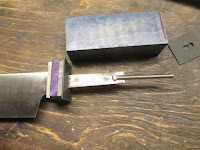 The holes are typically 9/32" and they extend into the block just enough to fit the tang. Again, testing, drilling testing. You can, to some extent, wiggle the block on the drill bit while it's spinning and shape the slot. Be careful though, bits can and will break with too much lateral force on them. From the opposite side, drill a 3/16" hole. This hole will meet up with the slotted region inside the block. I've cut and drilled or punched some spacers to go between the steel and wood. These are vulcanized fiber spacers. See you knifemaker supply house. 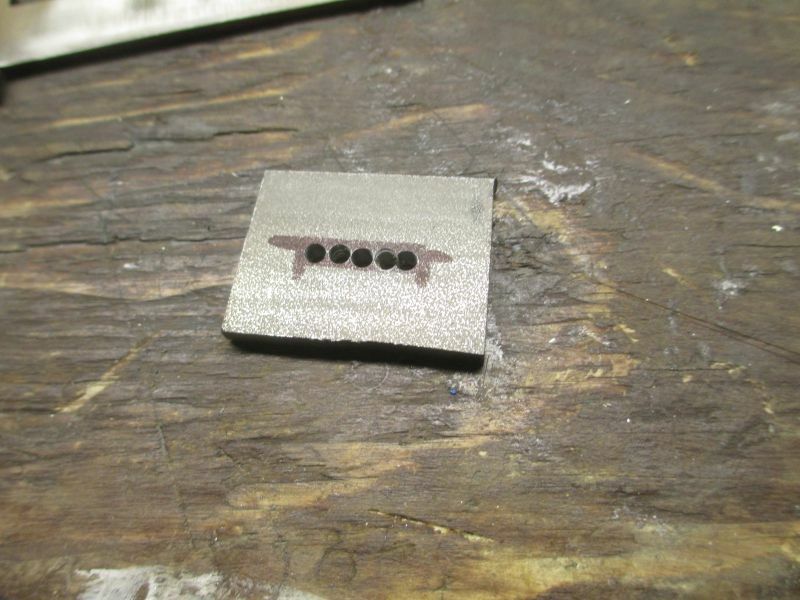 A heavy-duty paper punch works ok for making the holes. Again, all hidden so the holes don't need to be exact. Finally, the rear bolster can be cut, drilled and tapped to 10-32. I make this hole right in the middle so it lines up with the single hole in the back of the block. A drop of tap fluid or oil will help with tapping any steel, especially brass or copper which tend to gum up taps. Here I have the stack and have test fitted. 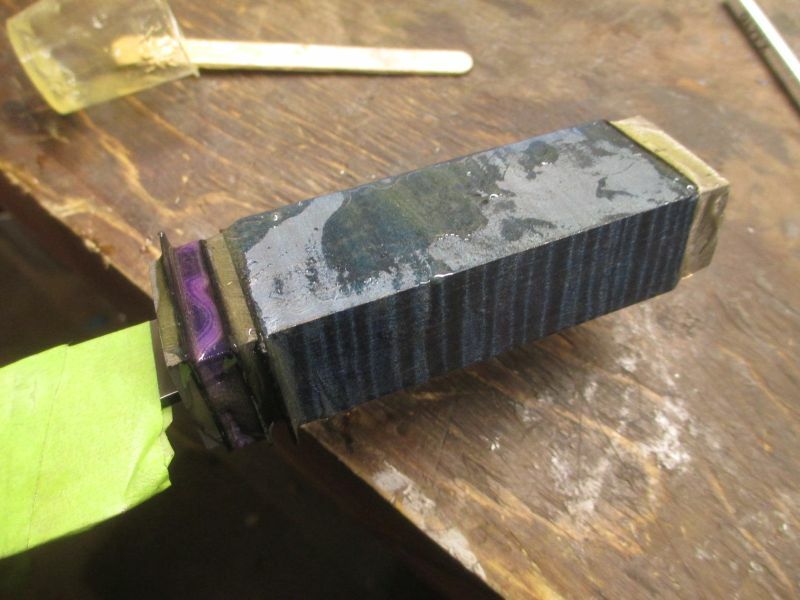 Fitting prior to gluing is called "dry fitting." Now I tape up the blade, tight to the front bolster and arrange the stack with everything in the correct order. 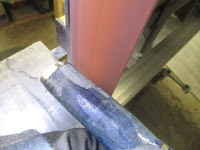 I mix up 10ml (2 TBSP) of G/flex and start by coating the back of the front bolster. Then add the next piece of the stack. Make sure enough epoxy is added. It will squeeze out. This is good. When you get to the point where the block is to be added we need to do two things. 1: fill the slot with lots of epoxy and 2: press the machine screw into the tang. Push the block on to the tang until the screw sticks out the hole. 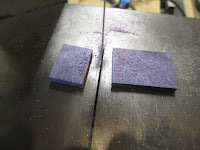 Add any spacers here, each with their own coating of epoxy. The last step is to screw the rear bolster on and turn it to tighten the stack. Being a fine thread you will be able to find a position that is just right. 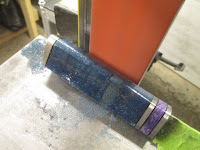 We want to squeeze everything in the stack and ooze a little epoxy, but we don't want too much compressive force to eject all the epoxy. 5 to 10 pounds force is what I use. Wipe up the excess epoxy as best you can. Clean around the blade and front bolster. Armor All wipes seem to work well for this. Now we wait for the epoxy to cure. With G/flex, I always wait over night. Before rounding anything, I like to square up the four faces of the handle to make a sort of rectangular prism. The flat plated works longways for three of the sides. The fourth side, the belly, needs to go across the platen. I use a 36 grit belt for this. I keep a bucket of water handy. Grinding the steel can build up a lot of heat. 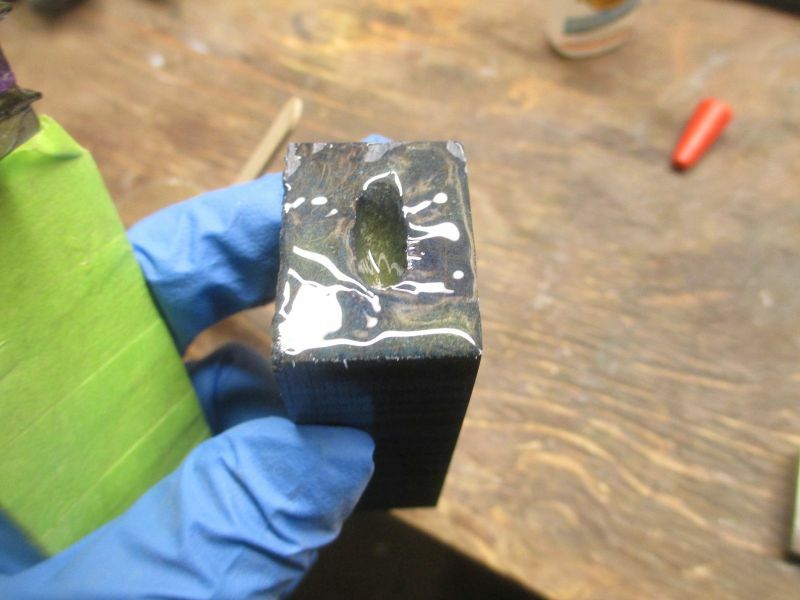 This heat will easily melt epoxy. 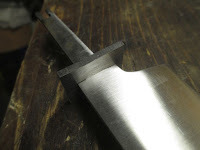 Once the faces are squared, I shape the angle on the rear bolster. This is optional, but I think it gives the overall handle shape more interest. I'll use a 60 grit belt for this. Now I start knocking off the corners at 45° angles. Focus on the hard materials (stainless steel) and glide across the softer materials. We don't want to apply even pressure all the way across or we'll end up with a depression where the softer wood is. Again dunking to keep the steel cool. Rounding the handle out. Checking the shape of the front and rear bolsters and holding the handle in your hands to check the feel. 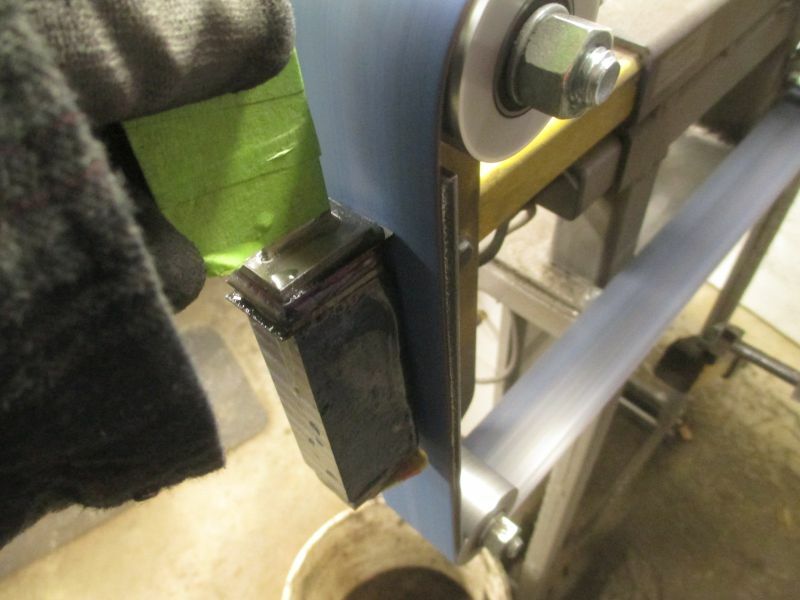 Using the slack portion of the belt lightly shape by holding the blade and rotating the handle around and 'round. I move to a 220 grit aluminum oxide belt for this. Followed by a 400 grit aluminum oxide belt. 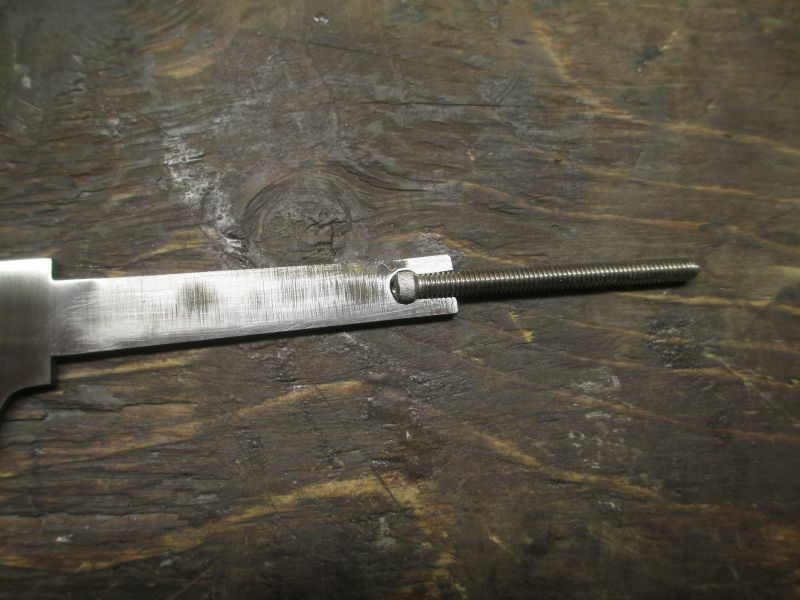 One last step will be to oil the handle with a buff with a clean cotton wheel. Wax or other sealants can be applied here.